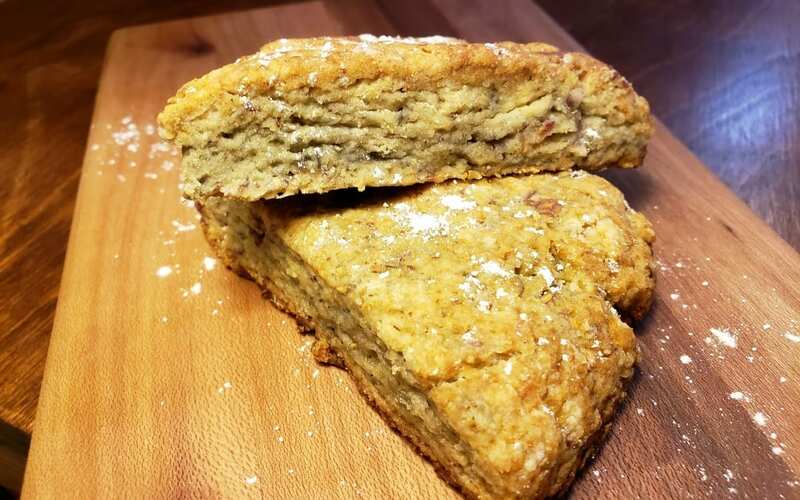 One of my happy memories as a kid was to walk up to a local restaurant with my mom and get her favorite baked item on their menu, a raisin scone. I remember they would package two round scones in a box for her and we would walk home to where she would sit and enjoy her scones with hot tea and cream. It is one of my fondest memories of my mom. I find that certain foods shared with friends or family bring back great thoughts and inspiration for me. Those times become more precious when I have lost that individual and the food we share becomes a highlight in my life that I only want to share with others to bring them joy too when they eat with me. This is what passion is about. Loving something so much that it becomes who you are deep inside and you want to share it with someone else. This is only the beginning of my scone recipe collection. This recipe was inspired by a recipe by Simply123allergyfree.com. The original recipe is for blueberry scones, but I was out of blueberries and decided to switch it up a bit to work with the ingredients I had. There was an office event that I decided to contribute some gluten-free and vegan options. These scones were a fantastic addition. I was a little surprised as I tasted the batter before and it wasn’t exactly what I planned it to be. After it baked, the taste completely changed. They were amazing, and those at the event liked them as well. Let’s put it this way, out of the non-gluten/dairy pastries, my gluten-free and vegan scones went fast, some going back for seconds. These scones turned out moist and had a texture like cake. One thing I learned while making these, fold in the berries. If you try to stir them into the flour and wet ingredients, they will break apart and turn your batter purple/pinkish, which may not be as pleasing to those eating it. We people can be funny about our food. I hope you will take this recipe and share it with someone you care about. Create the memory that can bring happiness and inspiration. These scones are full of flavor and a great tasty treat to accompany your tea, coffee, or milk beverage. Kid approved, the strawberry and raspberry pieces serve as an extra surprise with each bite. They are moist and have a cake-like texture. Enjoy. 1 tbsp flax seed meal (ground) Add 3 tbsp of water to flax seed and set aside. 1 tsp xanthan gum Omit if your gluten free flour has this. In a small dish, mix flax seed and 3 tbsp of warm water and set aside while you prep all other ingredients. Using a pastry cutter or a fork, take cold butter and cut it into the dry ingredients until the flour looks crumbly. Place strawberries into a bowl and mash with a fork or meat tenderizer, until strawberries are in small pieces. Drain liquid from strawberries, then fold into flour ingredients. Note: If strawberries are too moist, it will cause scones to be denser. In a small mixing bowl, combine prepared flax seed, vanilla extract, and vegan vanilla yogurt. Add wet ingredients to dry ingredients and mix until flour is moist and holding shape. Note: You can use a spoon, but I used my hands. Split dough evenly and form each section into 6-8 inch circle. Thickness should be about 3/4 -1 inch thick. Place each circle on parchment paper. Using a pizza cutter or sharp knife to cut 8 slices in each circle. Pull slices apart from each other to prevent them from sticking together. 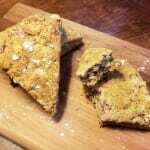 Bake scones for 20 minutes or until lightly brown. Perfect for a tea party, breakfast, brunch or dessert.